2018 was a full year for SCFS. We had four wonderful chapter meetings and two special events to support Beads of Courage and the BOC program at Children’s Hospital of Orange County (CHOC). Many thanks to all that participated in these activities and donated time and effort to supply BOC with thousands of beads in 2018. We had a wonderful holiday bash in December, at Wendy Leys’ home. Those that attended were treated to great food, a special raffle that included an oxygen concentrator, and a wonderful demonstration on making hollow beads by Charlie Warner. 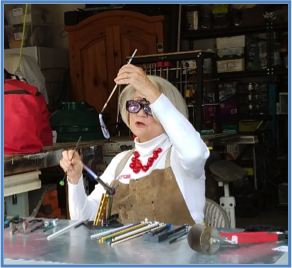 Member gifts this year included a blow tube and cabochon mandrel to help implement the skills shown at the demos by Charlie and Kathy Spignese. The SCFS Board is busy developing some great member activities for 2019. In addition to our quarterly meetings, we will hold another special bead event for CHOC in May, as well as a special workshop later in the year. Come to our March meeting to learn the latest about our plans for 2019. I’m excited to announce that we have a special location for our next meeting on March 2. We will be meeting at Karen Gassaway’s studio in the north San Diego area. Karen will give us a demo on making reactive shards, and there will be time for members to practice these skills on the torch after the demo. So, get a carpool together with your friends and join us on March 2 (details below). This will be a great chance to get together with members from the San Diego area and catch up on the news. The SCFS Board is busy developing some great member activities for 2018. 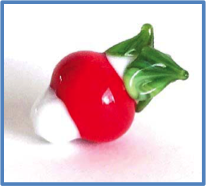 In addition to our quarterly meetings, we will hold another special bead event for CHOC in May, as well as a special workshop later in the year. 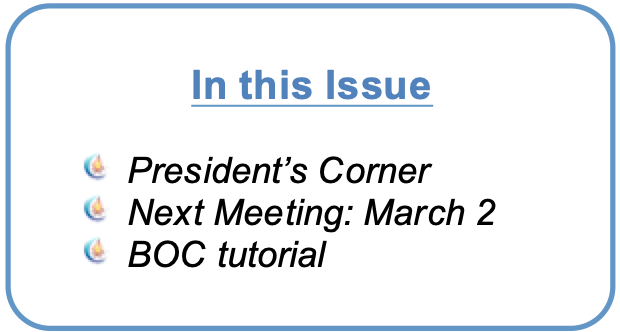 Come to our March meeting to learn the latest about our plans for 2019. Our March meeting will be held at Karen Gassaway’s home studio in Lakeside (greater San Diego area). Please note the change in time for this meeting, we will start at 11 am. Please carpool so as not to over burden the parking spots in the neighborhood. Karen has been making beads since 2005 after taking a beginner’s class with Heather Trimlett. She was still working as an Information Technology Manager at the time but knew after a while that melting glass would be a passion for her into retirement. 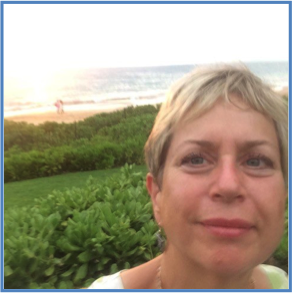 Karen’s favorite colors include blues and greens and a leaning towards organic reactions. She’s been making and selling reactive shards at the Gathering while experimenting with new color combinations. 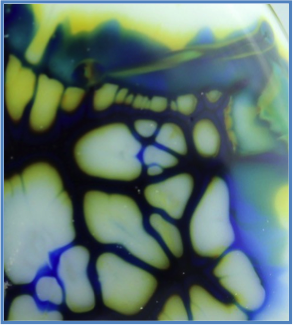 Karen enjoys using the shards for interesting backgrounds on floral or sculptural and organic beads. Show and Tell. Bring in some of your latest creations to share with the group. Glass Gift Exchange. Please bring in a wrapped glass item of your creation to exchange in our drawing. This is a great opportunity to get something special, created by one of our members. Food. We will provide sandwiches and drinks for lunch. Feel free to bring a side dish to share. Beads of Courage Donation. Please remember to bring your Courage beads for donation at the meeting. Courage beads are always in short supply and BOC never has enough of these beads to meet the need. Our contributions are essential to helping maintain the special qualities and benefits of this program. Courage beads are those with a special theme, size, texture, or sculptural element (without exposed reactive glass). Your orphan beads make perfect Courage beads, so clean out your inventory and give encouragement to a child. Our BOC partners at CHOC love to hand out seasonal or themed beads to encourage patients and give them a break from the medical routine. 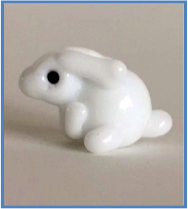 I encourage you to make some Spring or Easter-themed beads (flowers, eggs, bunnies) to bring to the meeting. We’ll make sure they get to CHOC and BOC in time for spring. I’ve include a fun tutorial for your inspiration. This tutorial is a fun an easy combo of a bunny and radish, authored by Nancy Smith. Perfect for spring. This tutorial is from the February 2017 issue of Soda Lime Times, produced by Diane Woodall. Get the tutorial here. These tutorials are made possible by the generosity of Diane Woodall and Soda Lime Times https://www.sodalimetimes.com/. Soda Lime Times is a great monthly publication for all types of flame workers and is also a major supporter of Beads of Courage. I encourage you to subscribe to this publication and support Diane’s efforts to support flame working and BOC.